The spring season is rocking along really nicely, and your farmers are thrilled at how healthy the crops are this year. Hard work plus excellent growing conditions means a bigger more beautiful share of the harvest for each of you! Dandelion Greens—Dandelion greens are prized by chefs and are considered a medicinal herb, great for supporting liver health. They can be added to your next salad, tossed on the grill, or sauteed with plenty of garlic. Swiss Chard—Large shares received this item. The leaves are very similar in flavor and texture to mature spinach and are great raw, braised, or sauteed. This crop was used at the Farm Dinner this Spring in a wonderful massaged chard salad with arugula. Lettuce—Red Romaine. Use in place of green romaine for some gorgeous color. Broccoli—Small shares received a few petite heads or several florets. Fresh from the field broccoli has an excellent flavor. You don’t need any tips from me on this one. Enjoy! Kale—Large shares received Red Russian kale. Tender and delicious. Small shares received curly kale, crisp and hearty for soups or kale chips. Try one of our many kale recipes in the kitchen blog. Arugula—Small shares received spicy delicious arugula. Serve in a salad with goat cheese and dried fruit. It’s delicious! Asian Spring mix—Large shares received our flavorful, colorful Asian spring mix. This harvest came from a fresh, new planting so the leaves are very young and tender. I would recommend it mixed into a salad with your kale or romaine this week because of how great the quality is, but they would also be nice sauteed. Onions—Each share received a sweet yellow onion. These are young, still uncured onions, so they should be eaten fresh. Use within 1-2 weeks. Turnips—Hakurei Turnips are tender, white globe turnips that are often called “salad turnips” because of their sweet, mild flavor. They are definitely the tastiest turnip we’ve ever had. The greens have been quite munched on by flea beetles, so just cut them off and discard. The roots are still as delicious as ever. Here are a few ways to prepare them. Daikon Radish—This large, tap-rooted vegetable is actually a radish! It’s a very long-storing crop so you can chop the tops off and store it sealed up in the fridge for several weeks as you gradually shave off and use what you need. Radishes are great as a crisp snack with salt and lemon. The many leafy greens will all last longest stored in the refrigerator, sealed up in a bag or container to retain their moisture. The onions can be kept out if eaten quickly, or refrigerated if you’ll use them later into next week. The radish roots should be severed from their tops to keep them firm and crisp, and the tops can be stored like the other greens. As a general rule, wait to wash any veggies until you’re ready to use them to help retain nutrients and prevent spoilage from excess moisture. 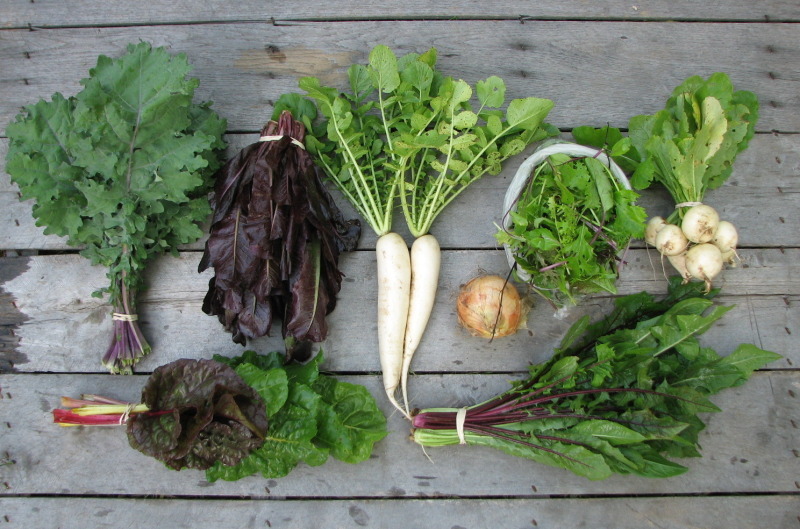 Large Share (from left): Red Russian kale, romaine, daikon radish, yellow onion, Asian spring mix, Hakurei turnips, and along the bottom, Swiss chard on the left, and dandelion greens on the right. 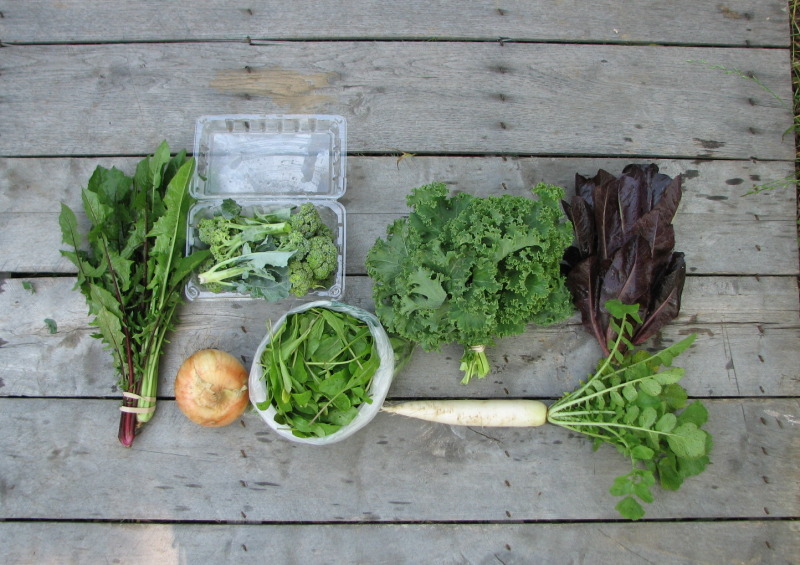 Small share (from left): Dandelion greens, broccoli florets, onion, arugula, kale, romaine, and daikon radish along the bottom (not pictured: hakurei turnips). These fresh veggies are the best. We love the assorted and unsual varieties and look forward each week to see what’s in store. Thanks so much, Manns! I’m glad you’re enjoying your share of the harvest.